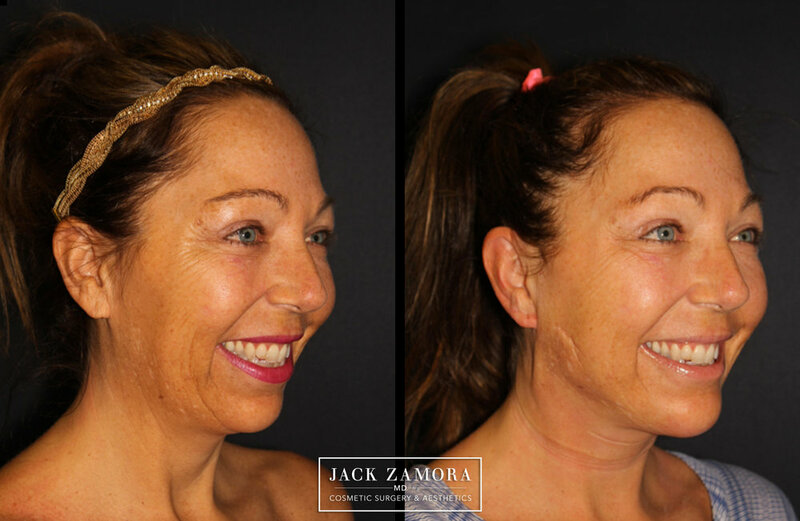 Developed by Dr. Jack Zamora, a Cosmetic surgeon in Denver, Colorado, the J-Plazty® Procedure is a remarkable advancement in minimally invasive face and body rejuvenation. J-Plazty® is a revolutionary minimally invasive procedure that uses Renuvion J-Plasma energy on the underside of the skin to instantly tighten and rejuvenate anywhere on the face and body. A unique alternative to traditional facelifts, tummy tucks and body sculpting, the J-Plazty® procedure will shrink and sculpt loose and lax skin without large incisions, downtime or the complications of cosmetic surgery. J-Plazty® Face uses Renuvion J-Plasma energy under the skin to lift, tighten and rejuvenate the face and neck giving you natural looking results with minimal downtime and no complications of a traditional facelift. J-Plazty® is unique because the plasma energy applied under the skin creates instant skin contraction resulting in improved laxity, tightening and shrinkage. Dr. Zamora has performed the J-Plazty® Face Procedure on men and women of all skin types and all age groups ranging from 30-somethings to 80-year-olds. J-Plazty® Face is ideal for those with mild to moderate sagging in the lower face, jawline, jowls and neck. A traditional facelift is recommended for those with more advanced needs. Patients choose J-Plazty® Face because they want good improvement but don’t want the downtime, expense and complications of a traditional surgery. Renuvion J-Plasma is created when helium gas is energized by radiofrequency energy and delivered through the J-Plasma® device. Because Helium gas is very stable, it can be ionized at very low energy ensuring flexible, precise and safe delivery. Plasma is cooler than laser energy making J-Plazty® Face a safer procedure with less risk and damage to the tissue, and affording patients a quick recovery. The level of improvement and rejuvenation from cold plasma energy is unrivaled in current technologies. No laser, ultrasound or radiofrequency treatment is capable of tightening and firming skin to this level. Our team at Jack Zamora MD Cosmetic Surgery and Aesthetics will assist you with all of the information you need for exceptional results with your J-Plazty® procedure. Dr. Zamora will address all of your concerns ahead of time and discuss what your desired results are. He will also explain his techniques and anesthesia options. Prior to your procedure, Dr. Zamora recommends you discontinue the use of products containing aspirin, garlic, ginseng, green tea and vitamin E for two weeks, as they may increase the risk of bruising. Performed in-office and using local anesthesia, Dr. Zamora starts the J-Plazty® Face Procedure with three tiny, hidden incisions under the chin and behind each ear. Dr. Zamora's proprietary technique includes invisible absorbable sutures placed under the skin to ensure a natural, long-lasting lift in the lower and mid-face. Dr. Zamora will then use the Renuvion J-Plasma® device sub-dermally to deliver plasma energy, which instantly tightens, shrinks and rejuvenates skin from the inside out. Results are immediate and continue to improve as your body continues to heal. Dr. Zamora and his team will check in with you after your procedure. It is normal for your face and neck to feel a bit tight or sore after the procedure. Minor discomfort can be treated with over the counter Tylenol. However, if your pain is unbearable, please call our Cometic Surgery office at 303-780-7377 immediately. The J-Plazty® Face Procedure takes about an hour and patients can expect initial tightness in the treated area. Pain is minimal and can be lessened with an over-the-counter pain reliever. Patients wear a facial compression garment for the first 72-hours. Mild swelling and bruising can take one to two weeks to resolve, however most patients are able to resume normal activities three to five days post procedure.